The Rivers State Governor, Nyesom Wike, on Saturday, declared that the government and people of the state would not abandon the six policemen that were dismissed by the Police High Command. Wike explained that the policemen were dismissed for political reasons, insisting that the officers did not commit any crime known to law. 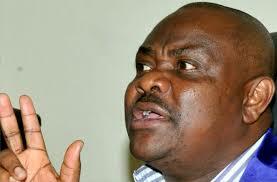 He pointed out that the government and people of Rivers State would pursue the matter through laid down legal processes. The affected police personnel are ex-Inspector Eyong Victor, ex-Sergeant Peter Ekpo, Oguni Goodluck, Orji Nwoke, Okpe Ezekiel and Tanko Akor. The governor spoke in Ahoada East Local Government Area during the defection of former chieftain of the All Progressives Congress and ex-chairman of the council, Mr. Cassidy Ikegbidi. He said, “They gave me policemen for my protection, but before I knew it, they have dismissed them. They think they are punishing them, but Rivers State will stand with them forever. “By the time we finish, they will realise that they have favoured the so-called dismissed policemen. In Rivers State, we don’t abandon people. No amount of intimidation will make me abandon these innocent policemen. “The policemen committed no offence. Simply because they followed their boss, they said they should be dismissed. Meanwhile, the national caretaker committee of the Peoples Democratic Party has called for the reinstatement of the six policemen. Spokesperson for the Senator Ahmed Makarfi-led caretaker committee, Prince Dayo Adeyeye, said the offense adduced for their secret trial and subsequent dismissal was a mere concoction and a ruse. Adeyeye said, “The hurried dismissal of these policemen is another valid pointer to the pre-election rigging plans and the assassination attempt on Governor Wike by the All Progressives Congress-led administration before the December 10, 2016 rerun elections in Rivers State. “It will be recalled that the Nigeria Police Force withdrew over 70 per cent of its personnel deployed to Rivers State Government House and the Chief Security Officer to the governor few days to the elections.